You might need a metal detector for a number of reasons. Most often, buyers use metal detectors to scourge for metals like gold and silver. 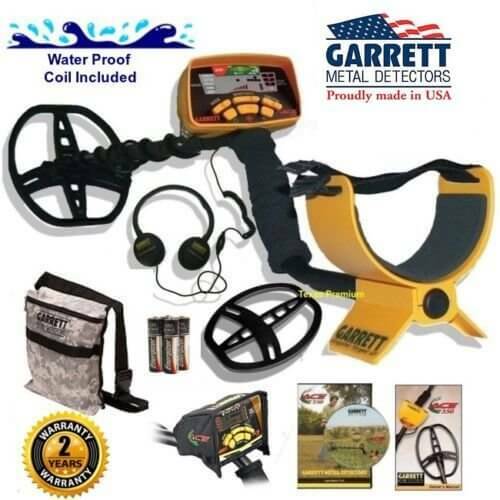 These metal detectors can detect any metal within the ground really easily, and so if you are a treasure hunter you would love owning a Garrett ATX. Archaeologists use it to unearth ancient ruins and to find any traces of materials from a bygone era. However, that’s not the only way people use metal detectors. Some people require to use the metal detectors near water and some people want to use the metal detectors to get hold of coins and jewelry. A stroll around your beach might just prove to be a lot more lucrative and fun if you have a metal detector with you. Read the latest ATX reviews by clicking here. There are thousands of people visiting beaches every day, and somebody may have left something out there, just waiting to be explored. Metal detectors can be a fun hobby and you would do well to buy an all purpose metal detector. These all purpose metal detectors can help you find all that you need, from gold to relics to jewelry really easily. And the new Garrett ATX does a good job at it. Here is a look at the Garrett ATX review you need to read. Garrett ATX weighs around 5 pounds and us about 68X4 inches. It is one of the most convenient metal detectors that you would find today, and is a handy and reliable machine when in need. Garrett ATX, as the name suggests is Garrett’s new addition to its premium product list. The product is easy to use and is comfortable for most who are looking for a top notch machine which can get things done for them. This means that Garrett ATX is perfect for the ones who are looking a product that can deliver quality and also saves them time. The price could be a concerned for a few, but the features seem to be doing a good job creating a balance. It would be best to roll out what the product has to offer to get to a fair decision. What is it that the new Garrett ATX does different? • Advanced Ground Balance: – Garrett ATX has a great balance given the ground surface it works on. It does not require any special mode changes or tricky adjustments to work on the ground with heavy mineral or on alkaline water. • Conditions: The machine is all set to work in wet, humid and all environmental conditions. It comes with a waterproofing effective upto 10 feet depth. • Length: – Garrett ATX provides flexible stem which allows the comfort of using the machine when it is fully extended, in between or fully collapsed. This provides a lot of maneuvering ease. • Battery: 8AA batteries are required. Good 10 hours or more indicator provides a successful operational use of the product. • Modes and settings: – Garrett ATX comes with sufficient modes that can be used according to the need. It has 25 modes which are supported by 13 sensitivity setting for those who focus on specific targets. It looks a lot like a weapon used by the military forces given its color and make. It is made in military color this gives it a great edge in the looks. It has a white logo from the manufacturer which is placed in a way to give it a complete look. It is built strong which shows in the body. The machine is large, but this does not mean that it is not easy to handle. In fact, Garrett is quite easy to maneuver, it can be taken out and used straight away. The machines screen display is quite simple and is very easy to operate. It has gone back to the basic and kept minimal self-explanatory controls on the screen. The display screen shows all the required information and covers everything which is used 99% of the times. The buttons around the screen are placed comfortably not to hinder in the process and shines bright even in great sunlight. It is nothing fancy when compared to recent LED displays, but this does not bring the quality and use of the product down in any way. In fact, it gives it a complete look of the military gadgets as discussed above. Click here to read more review’s. The detector is priced between $ 2100- $ 2500 which could be given the add-ons and discount applicable. The price is appropriate given the features and handling it provides. In fact, the product is quite affordable when compared to others that are offered in the market. The cost of the product includes the ATX detector, a soft case that is used to carry it, Landline headphones ( Water proof headphones might lead to an increase in the cost of the product), Pair of 8AA Batteries, Battery charger, 10” X 12” Search coil, etc. It is, however, advised that a thorough run should be made before the purchase of the product about the add-ons which comes with it. Garrett comes with a 10”X12” DD search coil as default, but there are more search coils that are available with added cost. There are three such varieties that are in the market. The other search coils that are available for extra cost are 8-inch mono search coil and Deepseeker 15”X20” Mono search coil. One must look at them and what they have to offer and buy the one that best suits the need. Garrett ATX comes with a two-year warranty. It is a limited warranty and is related to the parts of the product. The terms and conditions must be read carefully to understand what kind of warranty is being offered in given situations. The use of the modes depends on the preferences and need. The best feature of Garrett ATX is that allows you a freedom to work in all terrains. The perfect machine to take with you when you love to explore and does not like to be restricted. With great freedom comes two operational mode which allows a quick shift in the operational utilities to suit the need. The machine has two modes that it work on- Motion and Non-Motion. The two offers high performance and the result is something you would love. The motion mode may require you to check your search coil option and ask you to check the operational effectiveness as well. The Non-motion mode does not ask for the coil be operational. The modes do not require a lot of technical assistance and are easy to be used. Find The Best Price For The ATX Here. The great feature of Garrett ATX is its Audio feedback which allows a continuous connect with the results. The machine comes with 25 setting options that can be adjusted according to need and preference of the users. The resultant feedback is proportional to the strength of the target signal. Garrett ATX is at par in this feedback with most of the high-end metal detectors. It gives a great support in identifying target various types and information on their size. The user manual would be a great aid in understanding the signal types and how to operate the machine. The settings can be changed easily and the understanding of the same should be made to use the machine. Garrett ATX works on a 730 pulse per second frequency and has the capability of reaching depths of around 19 inches which is incredible . It is easy to test the frequency of the product which can be done using any stationary metal away from the detector and allowing the product to beep. It is not an easy task to detect things specially when the metals in the ground is so closely placed and has similar qualities. The Garett ATX has been made keeping these elements in mind and the machine allows suitable adjustment that would lead to successful identification of the targets. The machine comes with 25 levels of discrimination which means there are different adjustments based on the size and type of the target. This does not mean that the board looks messy, there are specific 13 such indicators which are placed on the screen with easy shift buttons placed below them. To even simplify the process, there are target buttons placed below the levels that shows the rest of the levels which lie between the number mentioned. So a button between 1and 2 would mean discrimination setting at 1.5 and would be shown by the LED light placed below the main levels and in between the shift buttons. To further support the detection process, there is a ground balance which allows no extra noise to tamper with the process. There is mineralisation in the ground which makes the machine buzz when one is on the quest of finding desirable targets; the ground balance helps one to keep the noises separated so that real target are identified without much difficulty. Once the ground balance is active on the machine, it is indicated on the display so that one is sure of the quests. The One of the most attractive features is its ability to be used in water. It is a great innovation in the product as it is not a very common feature. Underwater use has been one of the desired featured in a metal detector definitely and this is what makes Garrett ATX ahead of its peers. To support this feature, there are water proof speakers available as well, which shows that all aspects have been covered to provide a comfortable use. The Garrett ATX has a very efficient battery indicator that shows the status of the battery. It is always advisable that extra pair of battery should be kept handy just in c ase. The indicator on the screen for battery comes into play when the machine is switched on. There are audio beeps which show the current status of the battery. The batteries normally last for 10 to 12 hours. The indication of the battery shown by audio beeps is- 4 beeps for a fully charged machine, which decreases to 3 beeps when there is 75% battery and lower to 2 beeps with 50% battery and a sign of the battery need a charge when it gives just one beep. Along with these Garrett ATX has a very efficient Pinpointing feature which is accurate to the point. This allows the accuracy of the search and can even be tested with a simple search test keeping a target in place. The product also comes with simple comfort features which are useful even when not in use. Which is the very safe and protective soft cover which allows safety when not in use. Along with this the comfort that the machine provides when it fold itself to a small size. The collapsible feature makes the storage such an easy task. It even makes carrying it around such a hassle free job. What to expect The default settings of the product are for general use and include Motion mode and Zero discrimination. The ground balance is on neutral, which would need your immediate attention. The threshold is at a 7 and the sensitivity is adjusted at a 10. It is best to change the settings and the user manual is the best to support to make the changes. It is, however, easy to change the settings and does not require much effort. It is best to get acquainted with all the features in their basic mode and then make changes so as to avoid any discomfort. The use of the machine becomes very easy with the all descriptive user manual which comes with the purchase. With the knowledge of the default setting you to know what to expect, so when you move ahead with the used look for the mode first that you plan to use ( default Motion). Get comfortable and then you can go ahead to make test ( Sensitivity and Discrimination ) which will help you gauge what the product has to offer. It is always bested that various settings and options are explored in a stimulated environment to know the machine well. Also, a few adjustments will allow you to choose your best mode in which you plan to operate the machine. To read more review’s and also find the best price for the ATX click here. Hi, my name is Richard, I've been metal detecting for nearly 10 years now. I first got into it after running into an old friend on the beach who happened to be detecting (Mind he didn't actually find anything whilst I was there), it certainly got me curious. Since then it's been my biggest hobby so I decided to start this website and help other people get into it. Discover Some Of The Biggest Finds To Date!